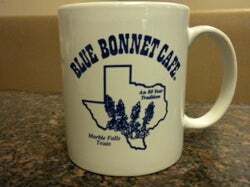 Bring a little bit of the Blue Bonnet Cafe home with our signature coffee mug. This is the same mug we use to serve coffee at the restaurant. The coffee mug features the state of Texas with bluebonnets and "Blue Bonnet Cafe An 89-year Tradition." Each year we update the number on the mug, making it a collectible item. Like the Blue Bonnet Cafe, these mugs last a long time. We've had people call or email us to say that they're still drinking coffee from their 15-year old mug and how proud they are to have one from so long ago. Buy one for yourself, a friend or a family member. Heck, buy a couple. It's the perfect souvenir or small gift. **If you're purchasing mulitple items that are going to different addresses, please make separate transactions for each item.